We all take power steering systems for granted. These are the systems in modern vehicles which allow us to turn the steering wheel without using too much upper arm strength. If power steering did not exist, so many people would have trouble turning the steering wheel, especially those who are older and not as strong. This would cause a lot of car accidents and other unfortunate situations. That is why power steering is essential to have in a vehicle. The rack and pinion are the two components which make power steering possible. Basically, they’re a set of gears inside of a metal tube. Both ends of the rack stick out from the tube and contain a tie rod. 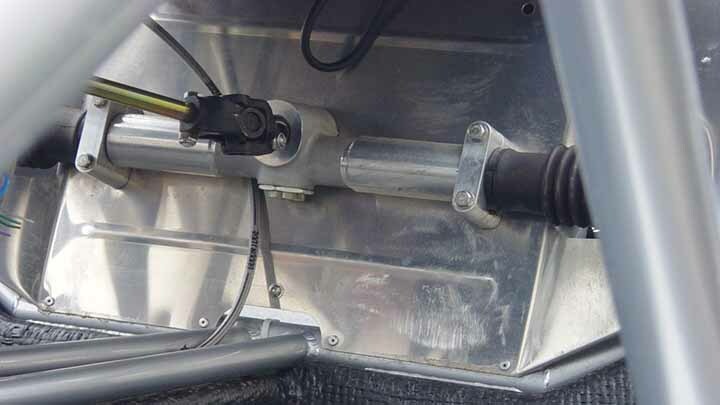 As for the pinion, one end connects to the rack and the other connects to the steering shaft, which receives the rotational movements of the steering wheel. When you go to rotate the steering wheel with your hands, it causes the pinion to rotate which then moves the rack. Each of the tie rods makes contact with the steering arm. This has a lot to do with why the wheels can turn so easily. Other components which assist in this process include the vane pump, hoses, and power steering fluid. There might be a situation someday where leaks come from the power steering rack and pinion. This gearset uses power steering fluid to make its movement possible. If there is insufficient power steering fluid in the system, the rotational motion of the steering wheel would not be able to become linear motion to spin the wheels. The causes of a rack and pinion leak can be attributed to wear and tear from consistent use or damage that has been inflicted upon them. Either way, you need to repair the problem immediately once you notice it exists. Below are the top 3 causes of a leaky power steering rack and pinion. 1) The Gasket is in Bad Condition – The gasket of the gearset tends to get worn out over the years. If the gasket gets too worn, then power steering fluid will leak through it. In this case, you will need to replace the gasket entirely. It is beyond repair. 2) Gearset Too Loose – It could be that your rack and pinion are not fit tightly enough, causing fluid to leak out of it. A mechanic just needs to tighten the fit of these gears and your leak problem should get solved. Although you won’t need to repair or replace any parts, you will still incur the labor costs. 3) Seals in Bad Condition – There are seals on every steering rack which are designed to block fluid from leaking out. Naturally, if these seals get worn out from years of driving, then they won’t do such a good job of containing the fluid anymore. If you catch the problem early enough, you can repair the seals without needing to replace them. Below are the top 3 symptoms of a leaky power steering rack and pinion. 1) Visible Fluid Leak – Obviously, the number one symptom of a leaky rack and pinion is power steering fluid leaking onto the ground. You will notice it is power steering fluid because it will have a red or pink color to it. This is a very distinct color that separates it from the other fluids in your vehicle. If you see these colors on the ground next to your vehicle, then you need to repair the leak promptly. 2) Whining Sounds – Power steering fluid lubricates the gears of the power steering system. If you have less fluid in the system, then the gears won’t be thoroughly lubricated. As a result, all the metal components which touch each other will cause whining and grinding sounds. The less fluid there is, the worse the sounds will be. 3) Trouble Steering – Without enough power steering fluid, there will be little hydraulic pressure produced to allow you to turn the steering wheel smoothly. This means you will have difficulties turning the steering wheel. It will feel tight, stiff, and it will require more upper arm strength as if there was no power steering at all. When your power steering rack and pinion start to leak power steering fluid, you may be able to salvage the problem by simply repairing the components rather than replacing them. The repair cost to fix a leaky rack and pinion will usually be a minimum of $1,070 and a maximum of $1,600. The exact price depends on the make and model of your vehicle. The cost of the parts alone will be between $700 and $1,100. As for the cost of the labor, it will be anywhere from $370 to $500. You also need to factor in the taxes and fees that will be added to the total cost as well. The repair job is so pricey because it takes a lot for the mechanic to gain access to the power steering rack and pinion. They’ll end up replacing all the O rings and oil seals during the repair process. A front wheel alignment will be done once the repair job is complete. Since a lot of mechanics charge between $90 to $150 per hour for their labor, a repair job like this one will probably take them about 4 hours or so. Therefore, the labor costs will add up quickly during each hour they are working.